The FCC chief Ajit Pai, a pledged Republican appointed by Donald Trump, is planning to ditch Obama’s US net neutrality rules and launch the world into a potential digital dystopia. This could spell the end to online freedom for internet users, restricting the content they can access, ending privacy and making the internet a very expensive place to be. When surfing online, you’d expect to be able to access any website of your choosing. You’d hope that if you Google a term, you’d get every option available, and not only a selected few. You wouldn’t think for a moment that perhaps your cable company is tampering with the data and limiting your access to certain sites, apps and content of its choosing – you expect total control; you expect net neutrality. 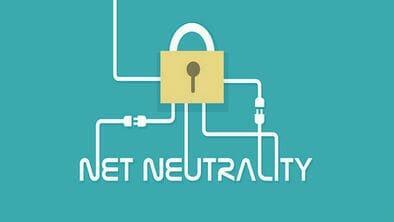 Ajit Pai, the chairman of the Federal Communications Commission (FCC), wants to change that. The fundamental principles of the internet are crumbling before our very eyes as Chairman Pai aims to dismantle the internet and make it a more “pro-competitive” marketplace. Net neutrality is what keeps internet service providers (ISPs) such as AT&T, Comcast, and Verizon from blocking content of their choosing, or from speeding up or slowing down certain websites and apps. In essence, it keeps the internet open and free, enabling everyone’s right to free speech. Under net neutrality laws, ISPs are prevented from blocking or discriminating against certain content and applications, making them unable to interfere with the content you post or can view online. Without net neutrality, ISPs would have the power to block for example, political content that it disagreed with, or slow down its’ competitors content, effectively deciding who is heard and who is shut out. They could have free reign to charge extra fees and completely destroy the open internet as we know it. The FCC announced that they plan to vote to turn the net neutrality Obama-era rules on its head and essentially privatize the internet. Chairman Pai unveiled his plan in early April 2017 behind closed doors. Although the official plan has not been made public, the FCC voted on May 18th to move the proposal forward. The showdown will commence on December 14th where the FCC will vote on a new order to repeal the current net neutrality protections, spelling a potential digital dystopia. The country’s internet provider, Meo, offers users to pay for a traditional “data” package but then groups certain data together as ‘extra’ packages, each costing more to add-on. For example, if you want a social package (including Facebook, Twitter, Instagram, etc.) you’d have to pay another €4.99 a month. Perhaps you’d like a music package (Spotify, SoundCloud, etc. ), you’d add on another €4.99. Or maybe a video package (including YouTube and Netflix), add it on again, or maybe you wouldn’t mind paying yet another €4.99 for a messaging package (including access to Skype and Whatsapp). After adding on all the different packages, users can find themselves with a hefty price to pay at the end of the month. Read More: Ajit Pai and the FCC Repeal Net Neutrality – What do We Gain and Lose? Tom Wheeler, who under Obama advocated for net neutrality rules and headed the FCC, told Brookings that Pai’s planned repeal “raises hypocrisy to new heights.” It could be a very dangerous internet model as it risks harming smaller competitors who don’t yet have a foot on the ladder, start-ups will be left scrambling to make themselves known. Big name apps could potentially pay telecom firms for advantageous access, whereas smaller companies would struggle to compete. Or worse, ISPs may not like a certain site’s politics and would have the power to throttle – or even block – the site in question. Supporters claim the change is a long overdue adjustment, opening up the door to a new era of news consumption, whereas detractors warn that it is purely a gift to telecom giants and that it will simply shrink the sources from which people gain their information. Advocates claim that without net neutrality, the government will be able to protect users from accessing sites that they shouldn’t, there will be less chance, for example, for a child to end up accidently looking at adult content. There would be better controls for preventing terrorism too – but all of this comes at a big price: that of online freedom. The government will have more control, and you can say goodbye to any form of internet privacy, as close tabs will be kept on every one of us. With three Republican and two Democratic commissioners, it’s looking like the move is most likely to be approved at the December 14th vote. Who in their right mind would want to pay differing fees, merely to be able to access different bundles of online services and sites? The open internet is so important to fostering competition and innovation; small start-up companies will struggle to get their voice heard as big corporations pay big money to get their products and services to be ranked at the top. ISPs are essentially the internet’s gatekeepers and with no net neutrality, they would have the freedom to seize every opportunity to profit. The only way to fight back is to make your voice heard. Shout as loud as you can, be it at a protest or online. Protest for the right to internet freedom, and be sure to use a Virtual Private Network (VPN) whenever browsing online. There are thousands of VPNs to choose from, so be sure to check out a VPN review before choosing. A VPN will encrypt your data and give you access to a totally private network allowing you complete online anonymity and hence protecting your right to privacy. Despite Mr Pai couching the net neutrality repeal as a victory for consumers, critics loudly blasted the move as a gift to telecoms giants. Next > Hollywood Takes Aim at Kodi. Who’s in the Crosshairs?